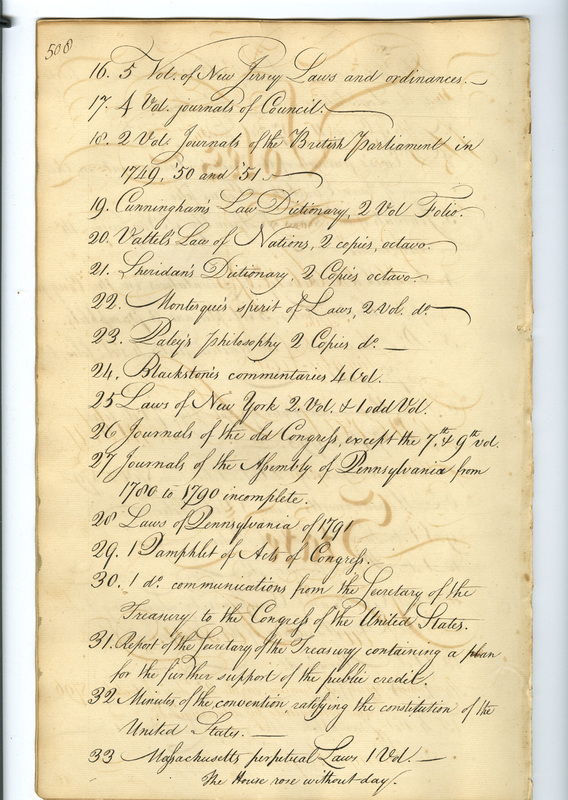 The New Jersey State Library dates its official inception to 1796 when, for the first time, the Legislature assigned responsibility for its collection of books to an individual, the Clerk of the House. But the origin of the State Library is actually much earlier. 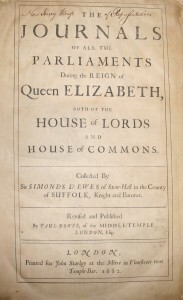 It began as a collection of books maintained by the New Jersey Assembly when New Jersey was an English colony. Over time this collection of books grew until it became a reference collection used by members of both houses of the legislature. Eventually New Jersey became a state and the collection came to be called the State’s library. 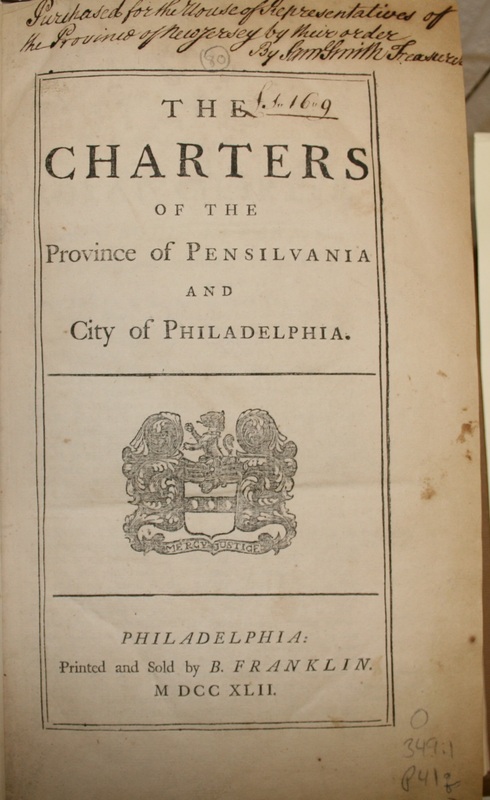 What follows is a brief history of this collection from its beginnings in 1704 as a single printed law to the mid-1800s when it had grown to thousands of volumes and was recognized by all as the New Jersey State Library. New Jersey became an English proprietary colony in 1664 and was divided into two entities, East New Jersey and West New Jersey, in 1676. In 1702 the Proprietors of East and West New Jersey surrendered the government of the colony to the Crown, and shortly thereafter the first New Jersey Assembly under the new Governor, Lord Cornbury, began meeting at Perth Amboy on 10 November 1703. 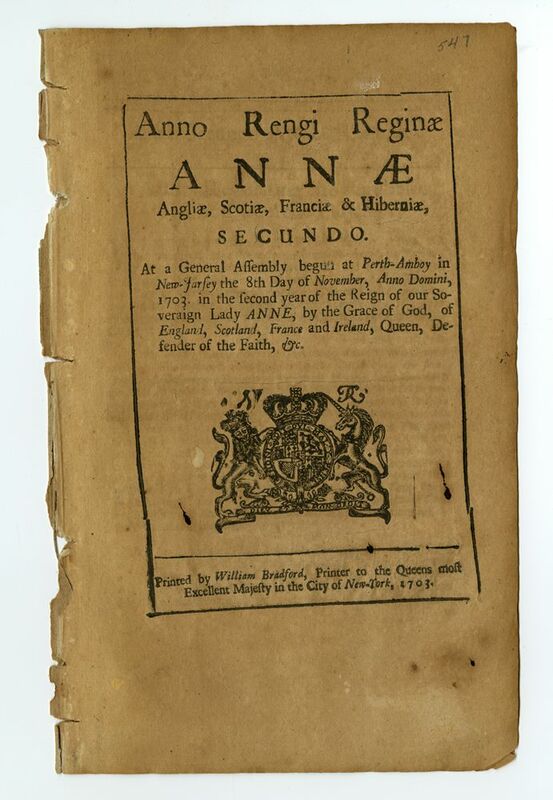 One law resulted from this first session, “An Act for Regulating the Purchasing of Land from the Indians.” It was signed by the governor on 13 December 1703. Copies were then printed by William Bradford in New York sometime between 13 December 1703 and 25 March 1704. 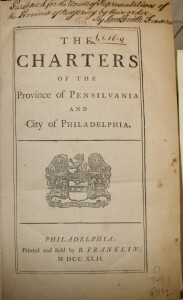 (Image of the publication’s title page provided by the Historical Society of Pennsylvania. Click image to enlarge.) This law is quite likely the earliest New Jersey provincial document to be printed. It is also likely that the New Jersey Assembly kept a copy for reference purposes. During the next few years additional session laws, ordinances, and other governmental documents were printed. 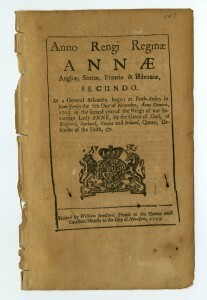 These printed publications formed the beginnings of a small reference collection kept by the Assembly for the use of its members. 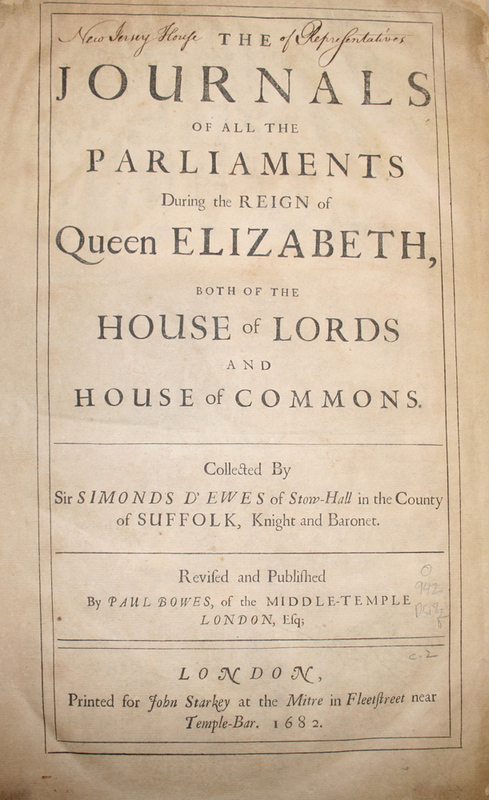 In 1711 the Assembly began printing its minutes generally referred to as the Votes & Proceedings. 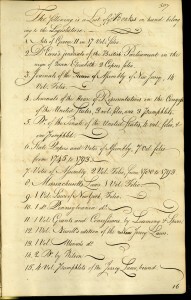 In the Votes & Proceedings the growth of this legislative reference collection is clearly documented, and one can track its development as it grew and eventually evolved into the library of the State of New Jersey. By this time the legislative reference collection had become a library in both fact and name. 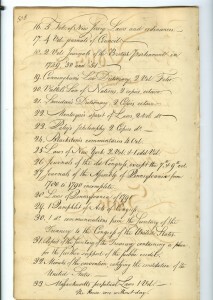 The Votes & Proceedings on 24 February 1804 includes A Catalogue of Books belonging to the Legislature of New-Jersey, the first listing specifically identified as a “catalogue.” This catalogue lists seventy-five titles, more than twice as many as the list made in 1796. With multi-volume works and multiple copies of some titles, there were probably over 200 volumes in the collection at the time. That the books be put under the care of the Clerk of the House. That none but the members of the legislature be permitted to take out books. That a stamp be prepared with which the words New-Jersey Legislature be branded on each book—with a number to each set to be marked on the back. That the list of books shall be printed in the votes of the House of Assembly with these rules for the information of the members. By 1838 the collection had grown from the 200 titles of 1804 to over 800 titles. These titles probably represented two to three thousand volumes. Also, the Catalogue of Books in the New Jersey State Library was issued as an independent volume. The library has copies of two additional updated catalogues printed in 1847 and 1853. By 1873 the collection consisted of over 18,000 volumes and the library was well on its way to becoming the great research institution that it is today. 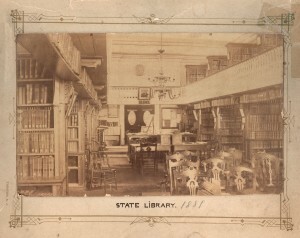 Shown here is the earliest known photograph of the library. 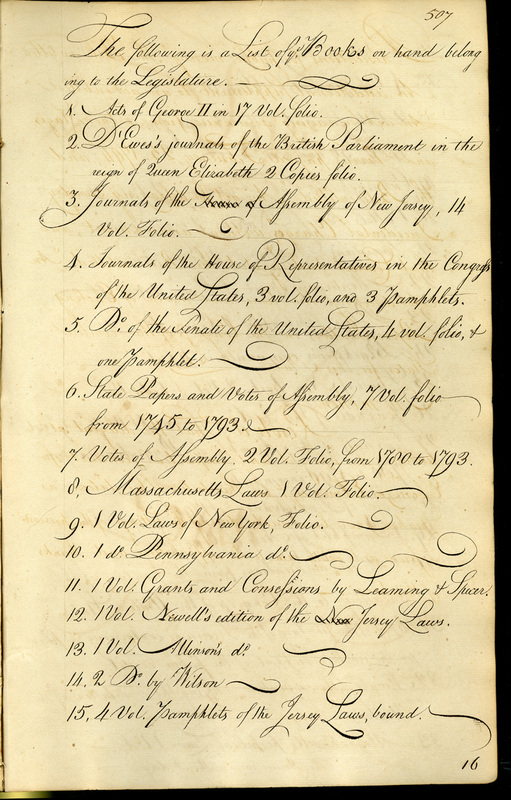 For a more detailed description of this period of time in the history of the library, read Genesis of the New Jersey State Library, 1703 – 1796: A Documentary History.